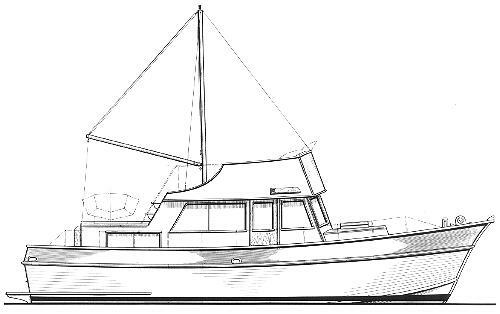 Cockpit size 4'-0" x 11'-0"
Deckhouse size 9'-6" x 10'-3"
Flying bridge size 10'-0" x 10'-0"
Fresh water capacity 230 gals. Hull type:Semi-displacement hard chine hull with efficient speed range to 10 knots. Build in plywood or "one-off" fiberglass. Bottom features deep bulbous forefoot with reverse curve at the chine. Plywood version: double diagonal plywood or solid wood planking on the bottom to a total thickness of 1", sheet plywood, double diagonal wood or plywood, or batten seam carvel planked sides to 3/4". Fiberglass version utilizes fiberglass planking or PVC foam sandwich construction. Balsa core can be used but not detailed in plans. Power: Single diesel engine recommended of approximately 100 SHP range with suitable reduction gear. Twin motors may be used but not preferred. Gasoline power is optional.